Suddenly the ladybird spread its wings and flew away. “That’s not very nice!” said a little voice. Rowena turned round and saw a tiny fairy, no bigger than a mouse, peeping out of a little door in the tree trunk. “You’ve scared her. She’s gone to make sure her children are safe.” “Oh, I’m very sorry” said Rowena. “I love ladybirds. I didn’t mean to scare her. Can she understand me?” “Of course she can understand you” said the fairy. “Are you real?” Rowena asked the fairy. “You do ask some strange questions” replied the fairy. “Are you real?” “Of course I am” said Rowena. “Well then!” said the fairy. “That’s that!” Rowena stared at the fairy. She had never seen anything so lovely. 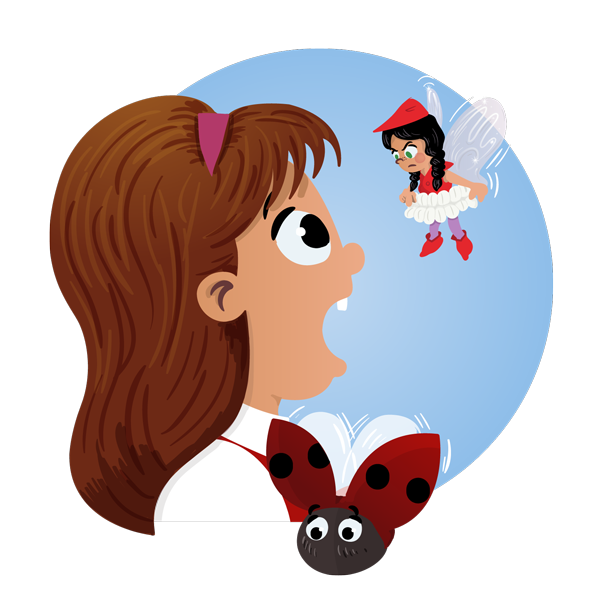 The fairy had black hair, tied in thick stubby plaits which hung over her shoulders. She had twinkling green eyes and rosy cheeks and on the bridge of her little turned-up nose was a dusting of freckles. She wore a red velvet waistcoat and soft red pointed boots and her skirt was like a ballet tutu made of white flower petals. On her head was a little red pointed cap like a flower. But best of all were the two gossamer wings that shimmered behind her. “It’s rude to stare” said the fairy. “And close your mouth. You’ll get a fly in it if you gawp like that!” Rowena closed her mouth quickly. This afternoon was starting to get interesting!